FREE BONUS FOR A LIMITED TIME ONLY: If you download this book TODAY, you will receive a FREE DOWNLOAD of Kitty Moore's best selling book, DIY Crafts: The 100 Most Popular Crafts & Projects That Make Your Life Easier! You will ALSO get FREE ACCESS to Kitty's Premium Image Gallery, which contains images of all the crafts featured in ALL of her books! The free access links are inside the book. 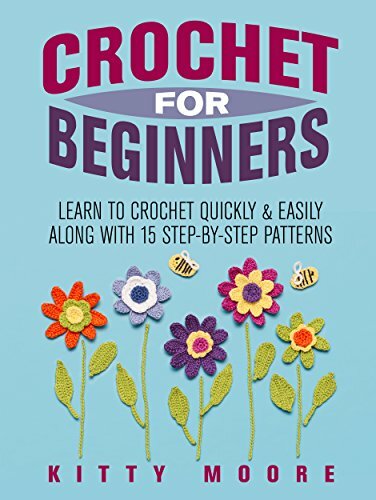 From the best selling arts & crafts writer, Kitty Moore, comes Crochet For Beginners: Learn To Crochet Quickly & Easily Along With 15 Step-By-Step Patterns! This book will help you learn the basics of crocheting along with the help of beginner patterns. Have you always wanted to learn how to crochet? Or have you not found the right learning material? This book provides you with a step-by-step guide to create your very own crochet items. Are you ready to experience crocheting on a whole new level? Then check out this book NOW! Well, what are you waiting for? Download YOUR copy TODAY!